INF-850 Size: 32 fl. oz. 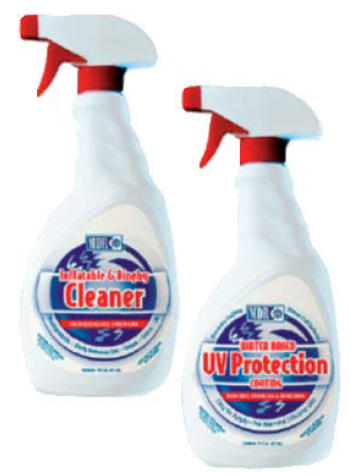 Everything needed to clean and protect inflatables from discoloration and fading in one convenient kit. Professional strength yet Inflatable Cleaner is biodegradable and mild enough not to harm inflatable materials including Hypalon, PVC, Vinyl and rubber. Easily cleans away dirt, grease and grime using fresh or salt water. Discoloration, fading and chalking are all signs of exposure to the sun’s UV rays. Inflatable UV Protective Coating is a quick drying, easy to use coating with NO HARMFUL SILICONE OILS. MDR-795 Size: 2 x 16 fl. oz. 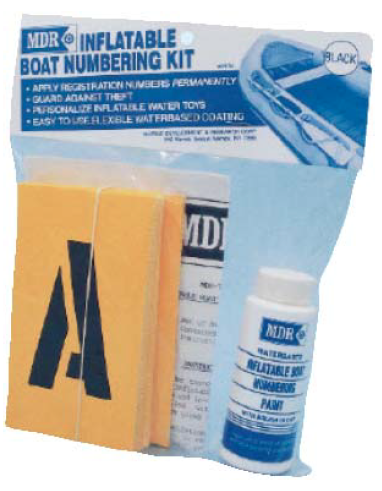 Easily apply registration numbers and letters directly onto inflatable boats using stencils and flexible vinyl paint. Non-toxic WATERBASED formulation in Black or White includes brush in cap. Once paint is cured, boat can be deflated and rolled up without damage to painted numbers. Kit includes a set of stencils with entire alphabet and numbers 0-9, vinyl paint and application instructions. Restores inflatables to their original color and luster from a multicolored, faded or discolored condition. Can be used on Hypalon, PVC, Vinyl and rubber inflatables. Easy-to-apply water based formulation is available in Gray, White or Lt. Gray Non-toxic, odor free. Can be applied indoors or in tight areas. Easily applied with brush or roller. Clean up with water. Flexible enough to last even when folded for storage. One quart covers approximately 100 sq. ft. Keep inflatables looking like new with MDR ’s specially formulated products. MDR-783 – Gray Size: 32 fl. oz. MDR-784 – White Size: 32 fl. oz. MDR-789 – Lt. Gray Size: 32 fl. oz. 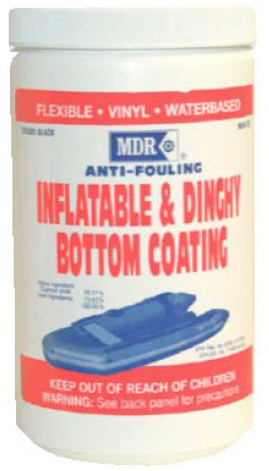 Finally, there is an anti-fouling bottom coating especially formulated for inflatables and dinghies. MDR’s Bottom Coating is a flexible vinyl, water based anti-fouling coating containing cuprous oxide for maximum protection Against barnacles and other marine growth in fresh and mid-temperature range salt water. It can be used on most inflatable materials including Hypalon, PVC, Vinyl and rubber, along with fiberglass or wood dinghies. Easy to apply with brush or roller and easy clean-up with water. Inflatables can be deflated and rolled without cracking bottom coating. 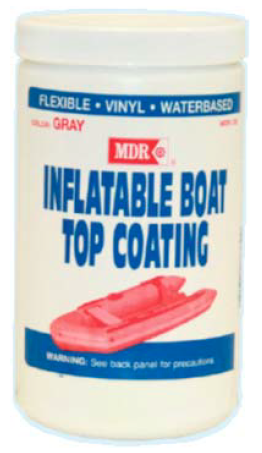 One quart will provide two coats of protection for the average eight to ten foot boat. MDR-787 Size: 32 fl. oz.